In this morning’s Breakfast With Dave newsletter, analyst David Rosenberg talks last week’s retail sales report. Don’t believe everything that you read, says Rosie. According to “raw data,” retail sales actually FELL 1.6% month-over-month in February, and you can’t just blame seasonality for this. Breakfast With Dave: “It’s always best to look at what consumers do rather than what they think or say. They’re spending — that’s the main thing”. That goes down as the glib remark of the weekend — front page of the Investors Business Daily (Shoppers Perk Up, Lifting Retail Sales, By A Surprise 0.3%). Another pundit said pretty well the same thing in Barron’s and following the data on Friday there was an economist on CNBC who said that you never win by betting against the U.S. consumer. Let’s more closely examine that retail sales report. First, the raw data actually showed that sales fell 1.6% mum in February. Now it would be meaningful if February was usually a weak month for sales compared to January so that it would make perfect sense for the seasonal adjustment factor to give the raw data an upward skew. But in fact, retail sales rise over half the time in February. And while, on average, the not seasonally adjusted retail sales data are down 0.4% in each February over the past decade, the reality is that this past February was four times as bad as the norm — not to mention tied for the third worst February since 1998. Really good result, eh? Second, here we have the greatest stimulus experience in seven decades and retail sales are still down 5% from the pre-recession peak and on a per capital basis are down 8%. Sales are actually lower today than they were in January 2006 — four years ago — even though the population has risen 4.3% over this time. And on a per capita basis, retail sales are no higher today than they were back in July 2005. 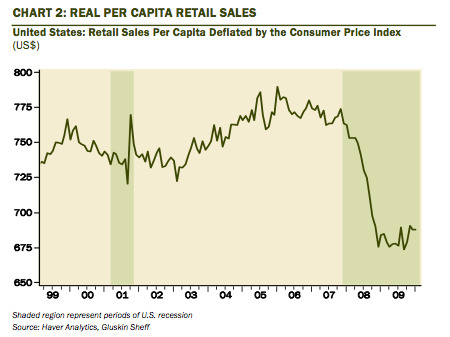 Then adjust for inflation and draw the picture of real retail sales on a per capita basis (see below) and you shall see that they are down to 1996 levels. Don’t bet against the U.S. consumer? Sure thing. negative on top of the detonating year-on-year pace in February 2009. • Building materials down 4% (-10.9% a year ago). +1.3% a year ago) and e-tailing, which is now up 11.8% (was -1.6% a year ago).